↑ Rebecca Raber (September 19, 2011). "Hive Five: Big Concerts With Big Draws". MTV. สืบค้นเมื่อ April 3, 2015. ↑ "The BRITs 1977 | The BRIT Awards 2012". Brits.co.uk. October 18, 1977. สืบค้นเมื่อ July 16, 2012. 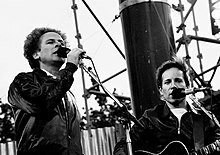 ↑ "500 Greatest Albums of All Time: Simon and Garfunkel, 'Bridge over Troubled Water'". Rolling Stone. Wenner Media. สืบค้นเมื่อ July 25, 2012.